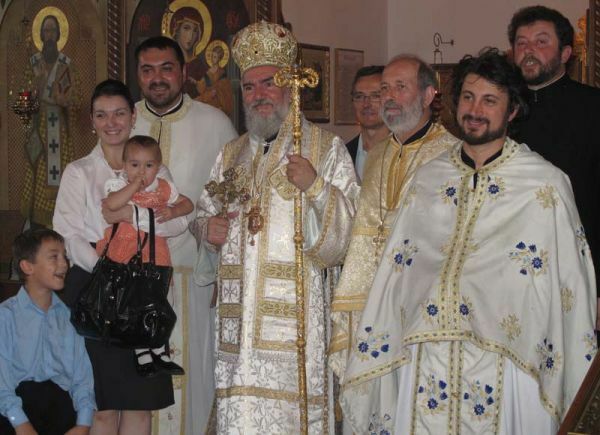 Windsor, Ontario - On the feast of St. Anastasija of Serbia, July 5, 2009, the Holy Hierarchical Divine Liturgy was served at the St. Demetrius Serbian Orthodox Church in Windsor, officiated by His Grace Bishop Georgije of Canada who was assisted by a number of diocesan clergy. We were honored to be hosts on this solemn and God pleasing day, this great gift for the Serbian Orthodox Church when, after many years, in unison we can lift our voices to our Lord Jesus Christ. Our hearts are filled with a great joy as we have received the blessing to once again be one in Christ and through Christ. A large number of faithful, who have been anxiously awaiting this day, attended the Divine Liturgy that morning. Bishop Georgije addressed the faithful during the liturgy in his archpastoral homily, interpreting the part of the morning's Gospel reading. Following the liturgy a luncheon was prepared in the church hall. Fr. Miroslav Ratkovic, addressing the faithful, with words of gratitude and exceeding love welcomed their new father and pastor, Bishop Georgije. Fr. Miroslav also greeted long time president of this church-school congregation Zarko Vucinic, who continues to be a great help in all good deeds done for the well being of this community as well as to all the people who have been joyously awaiting this day. The president of the church-school congregation Zarko Vucinic also greeted His Grace Bishop Georgije. Finally, the bishop spoke, thanking both clergy and president Zarko for their kind words, for the truly worthy welcome that he received to this parish and the love which he felt from all the members of this community. These words are written with great pleasure as well as the announcement that this long awaited day has finally arrived and that it came in a grace-filled spirit of thanksgiving. The joy is inexpressible, for there are no words to describe such an event.